The striking orange color of sockeye salmon flesh comes from eating plankton and krill while in the ocean. Fresh water lakes, streams and estuaries provide important habitat for spawning and rearing sockeye salmon. On the west coast of North America, sockeye salmon range from the Klamath River in Oregon to Point Hope in northwestern Alaska. Pacific salmon species on the west coast of the lower 48 United States have experienced dramatic declines in abundance during the past several decades as a result of several factors, including water diversions for agriculture and flood control; loss of habitat due to hydropower, resource extraction and development; and direct mortality from entrainment by hydropower projects. 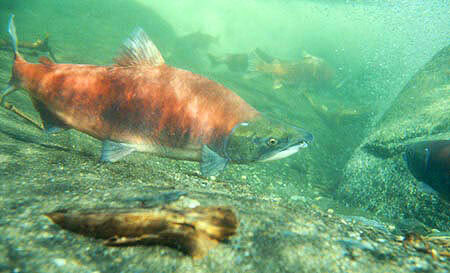 As a result, two lower-48 populations of sockeye salmon have been listed under the Endangered Species Act. For the time being, salmon habitat in Alaska remains mostly pristine. There are hundreds of stocks of sockeye salmon throughout the state of Alaska and their population trends are diverse: Some stocks are in decline while others are at equilibrium or increasing. Potential future threats include habitat loss, habitat degradation, climate change, and over fishing. Landlocked sockeye salmon rarely grow to more than 14 inched in length and are called “kokanee”. 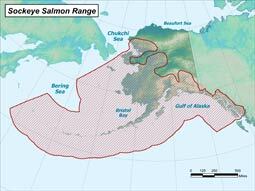 Sockeye salmon are the most economically important species of salmon in Alaska. Salmon use their sense of smell (“olfaction”) to recognize their home stream. Sockeye salmon filter zooplankton and other small animals from the water with their “gill rakers”. Research biologists and other specialists conduct applied research in close cooperation with the fishery managers. The purpose of the division’s research shop is to ensure that the management of Alaska’s fisheries resources is conducted in accordance with the sustained yield principle and that managers have the technical support they need to ensure that fisheries are managed according to sound scientific principles and utilizing the best available biological data. A variety of research is conducted each year throughout the state that explores topics such has stock and harvest assessment, population dynamics, genetic stock identification, and stock assessment technologies. Such projects are often conducted in collaboration with university, federal and international institutions. The results of these works are peer-reviewed and presented as written articles as well as presented at scientific conferences and meetings throughout the world.